Welcome to the website of ETIRA ! Here you can find all you need to know about the reuse of cartridges. ETIRA has a flyer that tells the reader to buy their remans only from ETIRA members. 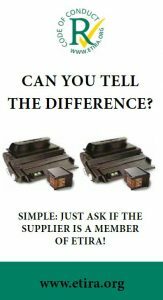 As an easy- hand out, the flyer lists the benefits of remanufactured cartridges compared to OEM and compatibles. The flyer can be downloaded by clicking here! Re-use your cartridges: Less expensive, and environment-friendly!! 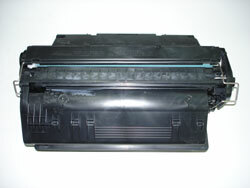 When a printer cartridge has been fully used, it can be remanufactured to be used again several times. This is a cost-effective and environmental-friendly alternative to buying a new cartridge. On this website you will find all the information you need about the remanufacturing of cartridges.